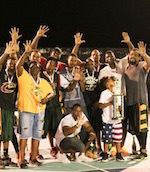 Anguilla Dolphins quite successfully finished their Leeward Island Championship campaign. The Dolphins clinched two wins in four games played in Antigua. Anguilla Dolphins opened the tournament with a 70:52 success over Barbuda Bucks. Rick Browne (197-F, college: Clinton CC (IA)) stepped up with 17 points and 10 rebounds to pace the winners. Lewis McWhirr and Daury Herbert accounted for 8 points each for the Dolphins. Coen DeSouza responded with 24 points for the Bucks. The Anguilla team faced the Antigua Bulldogs next. The Dolphins could not match the hosts effort and surrendered 50:95 at the end. Mario Davis posted 17 points to pace the Bulldogs. Javille Brooks (193-G, college: St.Vincent) responded with 11 points for the Dolphins. Next the Dolphins took on the Tortola Legs. The British Virgin Islands team rallied to a 91:79 victory. Kennedy Bass (196-F-81, college: Anderson, SC) came up with 32 points for the winning team. Rick Browne delivered 22 points and 12 rebounds for the Dolphins. Jason Hodge (201-F, college: Oklah. Panhandle St.) had 20 points in the defeat. The Dolphins managed to crown their campaign with victory. They outscored the Montserrat Volcanics 69:56. Incia Brooks (196-F, college: Clinton CC (IA)) chipped in 22 points in the win. Javille Brooks had 14 points and 12 boards in the victory. Vacheal Murraine netted 18 points in the losing effort.